(CNN) -- Philippines Sen. Benigno "Noynoy" Aquino III announced he will run for president Wednesday, a month after the death of his late mother, the popular former President Corazon Aquino. Philippines Senator Benigno "Noynoy" Aquino III announce his candidacy in Manila on September 9. "I'm accepting the challenge to lead this fight," said Noynoy Aquino, the state-run Philippines News Agency (PNA) reported. Aquino, 49, is the only son of Corazon Aquino, who died on August 1, and the late Benigno "Ninoy" Aquino, a senator who opposed dictator Ferdinand Marcos and was assassinated in 1983 on returning home from exile in the United States. 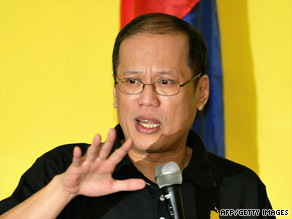 Noynoy Aquino said his mother's supporters had urged him to make a run for the presidency in next May's elections. He said he would continue the fight started by his parents to promote democracy in the Philippines. At least one lawmaker was critical of Aquino's run, PNA said. Rep. Pastor Alcover Jr. said the media has deceived the public by presenting Aquino as the man who can save the country. "We need a hardworking president," Alcover said. "But the problem is, Noynoy has a dismal performance as congressman for nine years and as senator for three years. Do we want more of his laziness?" President Gloria Macapagal Arroyo's term ends in 2010. Under Philippine law, she cannot run again. Arroyo first took office in 2001. Since then, she has survived several impeachment attempts and periodic rumors of coups. She won re-election in 2004, though opposition parties called into question the legitimacy of that race.